SmartCard proved it’s faster than using a credit card at Anarchapulco 2019, nearly half of all Verde Vegan’s crypto sales were SmartCash. SmartCash is taking over Brazil as real currency, DJ Cocino shows how he used Smart to buy glasses and watches at a mall! There was a SmartCash meetup in Montreal on April 5th meetup. A new season of the Smart Poker League Tournament has begun! You can pay at one of 42 Yamcol SmartPay enabled stores with SmartCash! SmartCash is elected number 1 in Brazil in Crypto Awards 2018. There are now a lot more merchants in Mexico accepting SmartCash. Brazil.smartcash.cc is live and an incredible resource for those in Brazil looking to get involved! SmartCash got visibility on Canadian National TV when they devoted an hour to crypto and blockchain. There is currently one proposal up for vote. Recently these proposals were passed: Spanish Speaking SmartCash Community Growth, Update Master Nodes Online, Sponsor TDC Florianpolis Edition 2019. 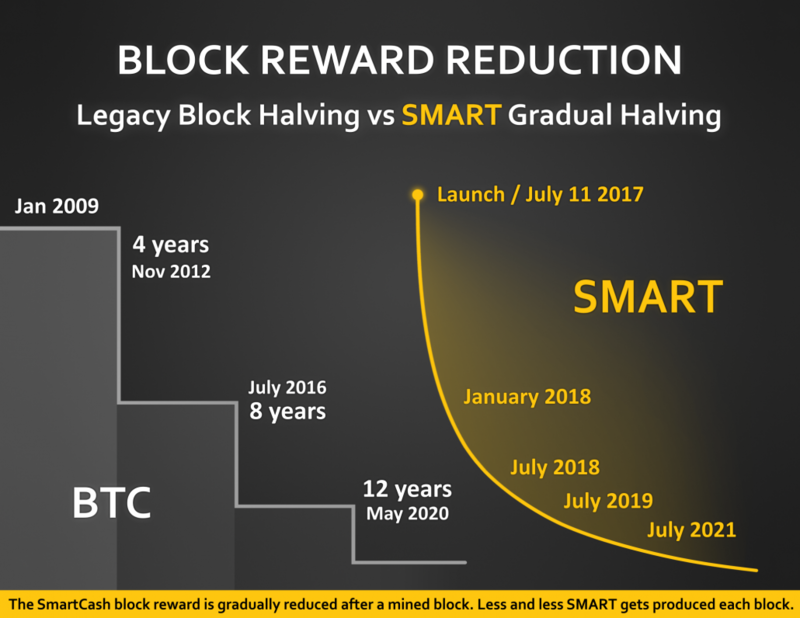 The SmartCash block reward is gradually reduced after a mined block. Less and less $SMART gets produced each block. The 3rd gradual halving will take place July 2019, followed by a 4th gradual halving July 2021. Scheduled Payments feature is now live on the web wallet: wallet.smartcash.cc. You can now send a fiat pegged $SMART amount on a set date and recurring basis. SmartCash is replacing Western Union in Switzerland and Portugal! You can now create an ATM Voucher that can be redeemed at ATM machines in Switzerland and Portugal! Zaphoid from SmartCash and Phil from Ellipal Hardware wallet discuss Ellipal on SmartTalk Radio show. Cryptide Rising unboxed the Ellipal Hardware Wallet on camera, which will soon integrate Smartcash. New member Lily Da Vine was added to the Outreach One Hive Team, recently interviewed by Zapoid on SmartTalk Radio. SmartCash is now available on the MonkeyTracking App! There are now 16,439 Smarties on the SmartCash Discord Server, 3,225 on Telegram, 14,115 followers of @Scashofficial on Twitter, 2,916 subscribed to /r/SmartCash on Reddit, 1,605 followers on Instagram, and a growing presence on Gab with 174 followers. We have 1,922 enabled SmartNodes, our blockchain has a current height of 972,637, and in the last 24 hours it has transacted 45,069,981.00 SMART via 5470 transactions! There are 21,396 addresses eligible for SmartRewards, which is currently expected to pay around 0.72%. Our official mining pools have a total of 1,016 workers and have paid out 12,694 SMART in the last 12 hours. CoinGecko currently has SmartCash ranked at #145. They report a 0.129% change in price and a USD volume of $582,020 in the past 24 hours.